Beyond sushi and sukiyaki, all kinds of Japanese dishes are being enjoyed around the world more than ever before. 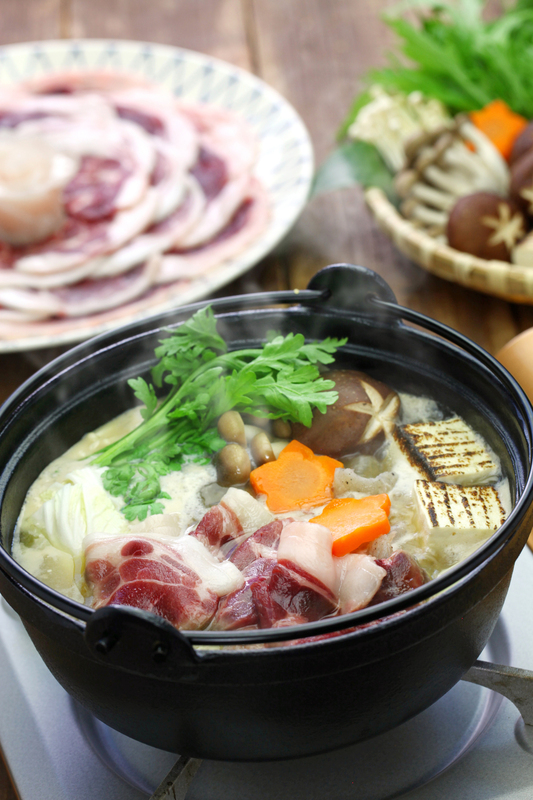 From recipes served at the family table to finely crafted delicacies, washoku, traditional Japanese cuisine, was registered on UNESCO’s Intangible Cultural Heritage list in 2013. 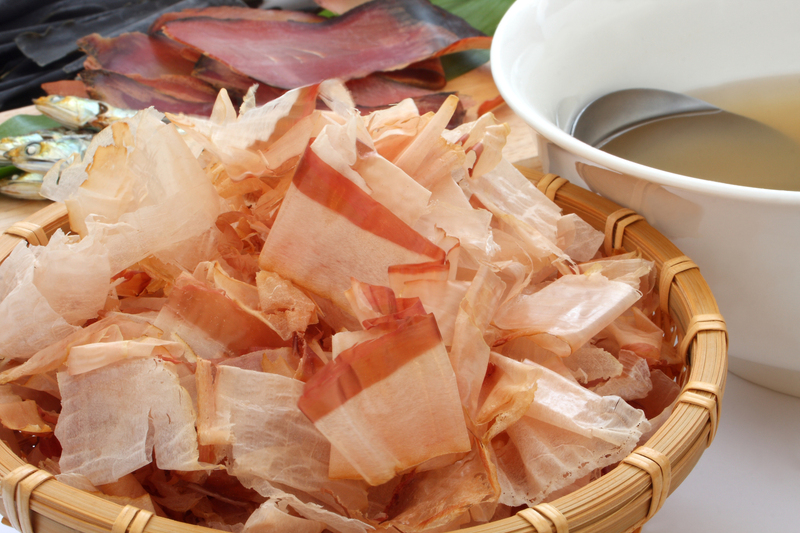 As many gastronomes may already know, dashi plays a significant role in many of these dishes. 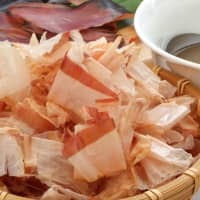 Japanese soup stocks are made of a combination of many dried ingredients such as kelp, shiitake mushrooms, katsuobushi (dried bonito flakes), sardines and flying fish. Each ingredient has its own optimum soaking time depending on the temperature of the water and this is factored into the variety and amount of each ingredient used. 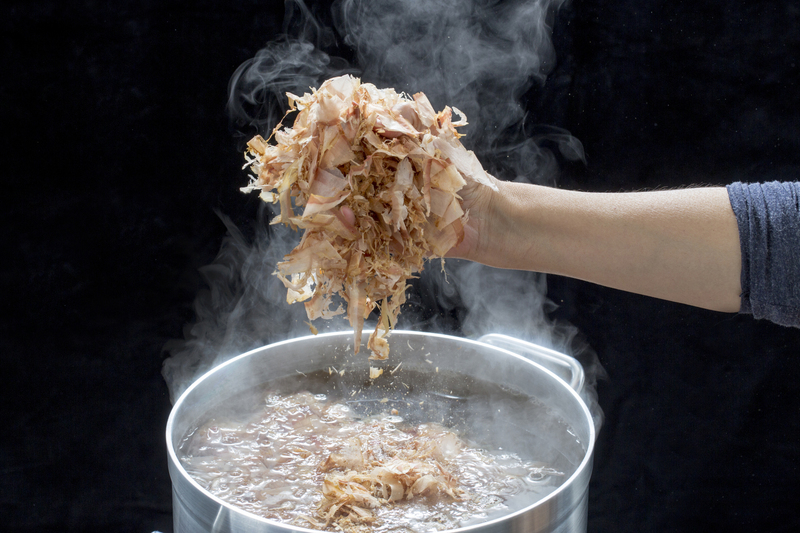 Individual households and restaurants have their own blends of dashi for different dishes, but before running into too complex a labyrinth of various combinations of ingredients, temperatures and methods, there is one important scientific factor that is essential knowledge when making dashi. 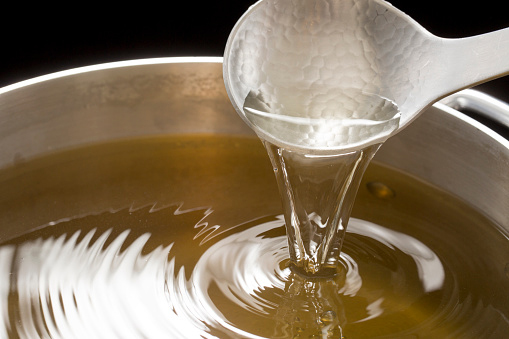 The characteristics of the water used defines a dashi’s umami. Umami is the fifth of the five tastes after sweetness, sourness, bitterness and saltiness. 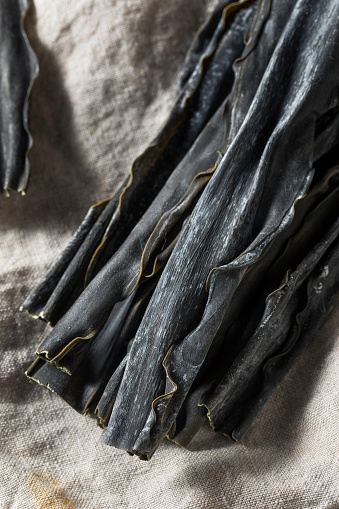 From a scientific standpoint, glutamic acid, inosinic acid and guanylic acid are the three major elements of umami. Professor Yoshiyuki Tatsumi of the Kobe Ocean-Bottom Exploration Center is not only a renowned magma specialist, but also known for his scientific insights into Japanese food. 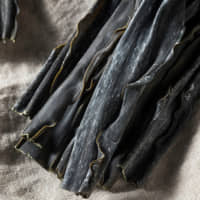 He writes in his book “Washoku wa Naze Oishii — Nihon Retto no Okurimono” or, “Why is washoku delicious — a gift of the Japanese archipelago,” that kelp contains 10 times more glutamic acid than onions or carrots, and katsuobushi has several times more inosinic acid than chicken, pork or beef. According to Tatsumi, it is soft water that effectively extracts the umami of these ingredients, whereas abundant minerals in hard water seal the surface of the ingredients, trapping the umami inside. 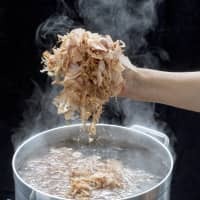 On the other hand, the strong smell of meat and poultry can be better removed when boiled in hard water because fatty acids and proteins that are responsible for the smell bond with calcium, forming scum. Soft water does not contain enough calcium to rid soup of the harshness caused by animal meat. 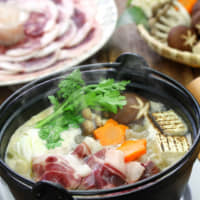 Naturally, Japanese living in a country abundant with soft water and Europeans blessed with hard water use what is available to them when making dashi or soup stock. Tatsumi said in an interview with The Japan Times that even within Japan, the hardness of water differs among regions. Compared to the Kansai region, which is known for its rich food culture, water in Tokyo is harder. “Many good Japanese restaurants in Tokyo have soft water delivered,” he said. According to Tatsumi, terrain is partly responsible for the difference in water hardness. Tokyo is located at the heart of the wide and flat Kanto plain. Rivers on the flatlands flow slowly and smoothly, allowing minerals contained in rocks to dissolve into the water. This explains why Europe, which consists mostly of vast plains, has an abundance of hard water. Tatsumi indicated that another factor involves the types of rocks the minerals reside in. Japan has a lot of granite that contains less minerals than limestone, which is much more abundant in Europe. Why is Japan so mountainous and its rivers so rapid in a land made of granite? “It is because Japan itself is a mobile belt,” Tatsumi said. In the earth directly beneath and near the islands of Japan, four plates are pushing against each other. He explained that upwardly thrusted land forms mountains and the subduction of plates creates volcanoes. Magma then cools and forms granite rocks, and rivers flow rapidly along steep mountains and hills to reach the sea before minerals are released into the water. “We benefit from the land of Japan as a mobile belt in the form of wonderful natural ingredients. This also means that we live with the force of nature, through the hardships brought by earthquakes and volcanic activities,” said Tatsumi.